In many cases of river flooding, decades of urbanisation and intensification of agriculture has reduced infiltration of rainfall, which leads to flash floods following a downpour, and lowering of the water table during dry spells, as well as soil degradation. Conventional approaches to solving flash floods have been to build flood defences and walls, and dredging and clearance of streams to improve drainage, where the problems occur. As long term solution, this has its limitations. It pushes floodwater downstream to the next community, prevents further infiltration, it destroys the habitats and wildlife connected to the water courses, and this hard engineered approach often costs a lot of money for limited protection. 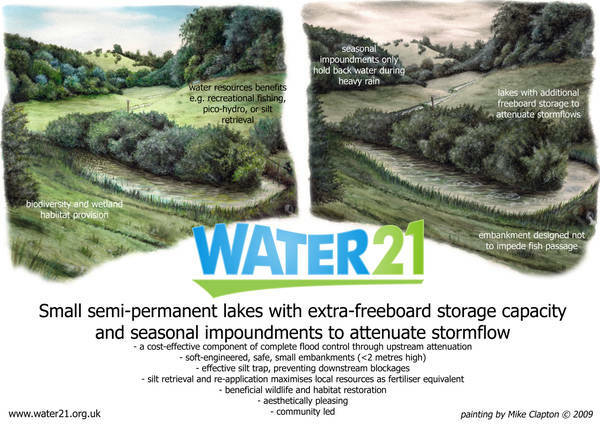 Water21’s vision is to restore the natural storage capacity of the landscape, attenuating (slowing and holding back) water in the upstream areas, and making space for water to flood away from homes in the downstream areas. At the same time as preventing floodwater from rushing downstream, it helps to infiltrate the water to restore over-abstracted water tables, provide new habitats for wildlife, enhance the beauty of the landscape. It is also often possible to benefit from clean renewable small scale hydro-power or recreational fisheries. Because the features are small and local, landowners are in a position to easily retrieve any silt that accumulates for recycling the locked-up nutrients, that would otherwise escape to the ocean. creation and restoration of buffer vegetation to increase the “hydraulic roughness” of the land, slowing down the rate of runoff, and promoting infiltration into deep soils via root structures. For downstream zones, communities must be empowered to resist further development on floodplains, spot unconsented changes to watercourses, and work together with authorities and experts (both local and external) to decide how best to manage the floodplain zones (including sluice gates where relevant). For more information, see the Case Studies page.